If you are looking for a crazy nightlife, then Venice is not your city. The city thrives off of their amazing bars in Venice for a great aperitivo and a good atmosphere. Sure, some bars in Venice open late, so you will still have your night out but don’t expect dancing until the wee hours of the morning. That’s the beauty of Venice bars Italy; you will find good quality with good vibes. When in doubt, bars in Venice, Italy are plentiful in Campo San Margherita and along the Fondamenta dei Ormesini. Venice bars and clubs are usually enjoyed most by taking a drink and cicchetti (snacks) outside and taking in your surroundings. Looking for eating out in Venice? While many bars listed on this page have live music, these are the ones that stick out for this reason specifically. A very cozy atmosphere, think your living room, where you can sit around kitchen tables speaking to locals, visitors and students all while enjoying live music. You will not find a bar full of tourists, however, you will find a bar full of young people, fresh drinks and great music. Right near the Grand Canal, you can eat here during the earlier hours and after enjoy a drink and live music every night. Let’s face it, you are going to find wine anywhere you go in Italy. However, these bars offer a more extensive selection. The oldest wine bar Venice, Italy has to offer, equipped with an ever rotating menu of over 1000 different wines. As it closes early, this family run bar is the perfect way to start your night before dinner. Stay at the bar and enjoy a glass of wine or cocktail or take it canal side to enjoy the sites. Munch on some of the best cicchetti that Venice can make. As you can probably tell from the name, they serve prosecco, but not only! Here at Al Prosecco, you will find a more obscure wine list to choose from. Run by Mauro Lorenzon, this is one of the Venice bars and restaurants that you will want to visit. Come here for a full dinner or just apps and wine for later in the night. Thriving since the 1930’s, this famous bar is worth the expensive bill at the end. Come try a bellini at the place that it was born! Arguably the best bar in Venice, Italy. 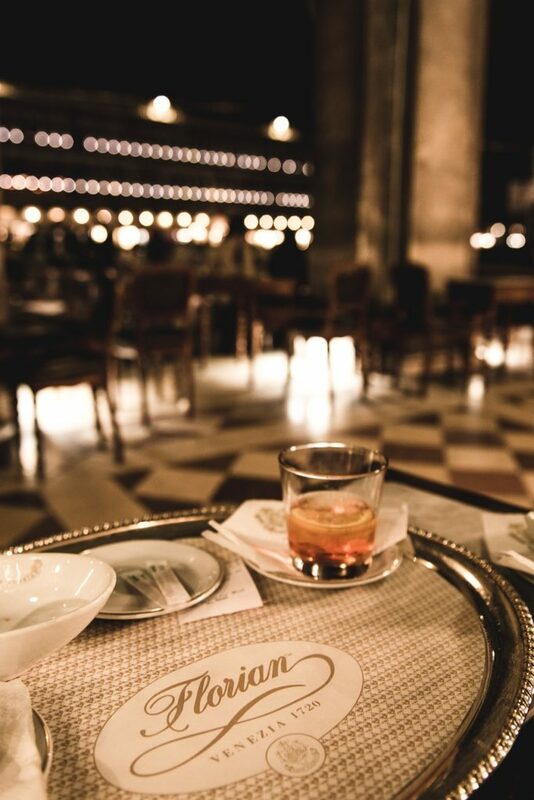 What sounds better than overlooking the beautiful Piazza San Marco in the longest continuously running café from 1720. Grab a coffee or enjoy a cocktail and remember you’re also paying for the location! On the island of Giudecca, you will be able to enjoy a hand crafted cocktail while appreciating the best view of Venice. They’re all cool, trust us, but here are some other bars we think you should know about. Even when the bar closes, the party continues in the square that this bar calls home. Here you will find a meeting point for artists, students, tourists and locals all in one. At this restaurant/bar, the party doesn’t stay inside, in fact it goes onto the canal. We highly suggest enjoying your aperitivo aboard this restaurant’s boat! One of the Venice alternative bars as it’s a bit quirky and caters to the artsy youth and students of the city. Check out for their special theme nights! And when all is said and done, there are always the Venice airport bars, like Decanto Wine Bar, so you can savour that one last drink of your vacation before heading home.